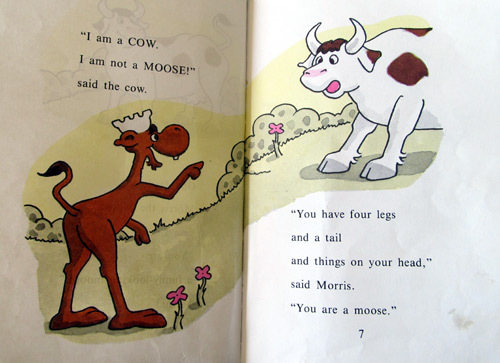 Those of you who are familiar with children’s literature have probably guessed from this post’s title that today’s cow is right out of Bernard Wiseman’s famous book Morris the Moose. Poor Morris walks around his neighborhood thinking every other animal he runs into must be a moose because they share some similar attributes with him. This is a great lesson of logic for little growing minds and a real fun book to read out loud. 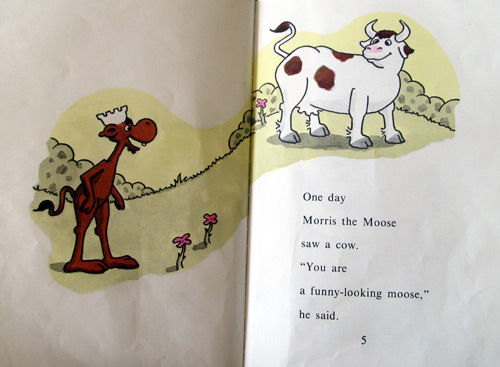 Morris the Moose’s first victim happens to be… a cow! This poor cow gets more confused and frustrated with every line of dialog. If this cow doesn’t think it looks like a moose, maybe they sound the same? Hmm, now that’s a stretch, Morris! 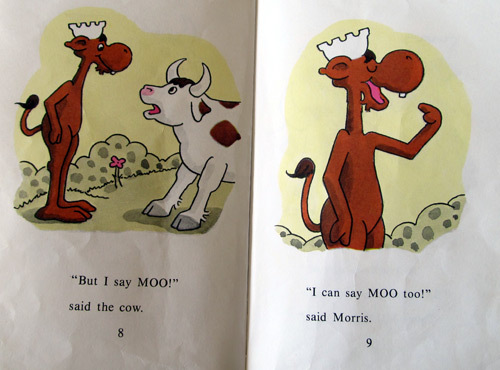 Morris the moose - are you a cow if you can say moo? The poor cow resolves to use genetics to prove her point, but Morris just won’t give up. 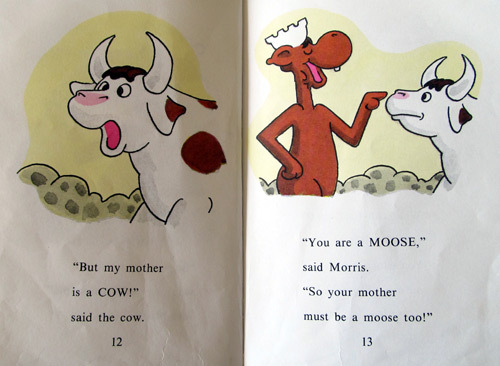 Morris the moose shares a mom with the cow? If you think that’s a lot of cows for one book, you may be surprised to hear that this cow appears in several more pages, along with a deer and a horse. Morris comes to his senses by the end and I get to overfill my quota of cow sightings for the day. Thanks, Morris! Previous Post More Chick-fil-A cows, please! Sounds to me like you are!